So the Mr. and I went on a date (a real date!) this weekend. With dinner and a movie and everything. We thoroughly enjoyed sitting on the lovely patio of the newly opened Grand Avenue Salut, where we laughed at other couples trying to control their toddlers and sampled the "city's best french fries," (not bad at all). Brent got a steak, which was really delicious, I got a salad, which was quite delicious, and we shared some soup, which was not delicious at all. But that was quickly and politely taken off of our bill, so overall it was very pleasant. I had my heart set on eating outside, which is a dangerous expectation on a beautiful June evening. We were there very early so hardly had to wait at all. But when we left around 6:45, the place was jammed. A family was wedged into the waiting area, balancing drinks and pizza on their laps, and I heard the dad say, with false brightness, "It's like we're having a picnic!" Which for some reason I found hilarious and embarrassed myself by laughing out loud. 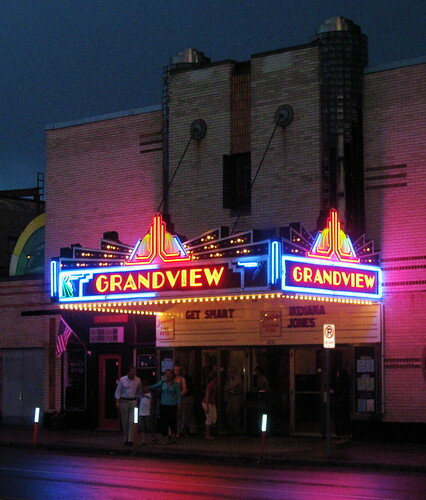 We went to my wonderful old neighborhood to see Get Smart at the Grandview Theater. It is strange and sweet to drive around near my old apartment, the apartment I still dream about, the one I would rent if I had a million dollars, just so I could walk into it and smell it every now and then. It is not that close to our neighborhood now, so it was an impractical frivolity to have our date on Grand. But Brent said so many times, "No YOU pick what we do." That I got flustered and blurted out what I wanted to do. New French restaurant, old cozy theater. So there. See what you think of that date idea. That'll teach you to pressure me into making decisions. Everyone knows I prefer to let others make decisions and then complain about it later. But, it turned out to be a great evening (much better than last time I picked, when we ended up at Lowe's looking at faucets). Bella, by the way, was busy at daycare having a Mexican Fiesta and dying herself blue with Dairy Queen Rocket Pops.